We have developed a highly intelligent system that can recognise the action on the pitch. With the position of players and the ball, we create a video for you that follows the ball. It automatically zooms and pans depending on the ball position. We have perfected our recognition software to be able to find any football no matter the size or colour. No need for special footballs, chips etc. Wanna have a full overview over the pitch? Watch everything in one frame. Watch the recording from every possible angle. Never miss out on anything. Adding AR overlays to the pitch helps you understanding the positioning of your players. We automatically detect the ball and follow the ball throughout you recordings. With Veo, you have the luxury that the full pitch gets captured. That gives you the ability to watch plays outside the conventional framing. 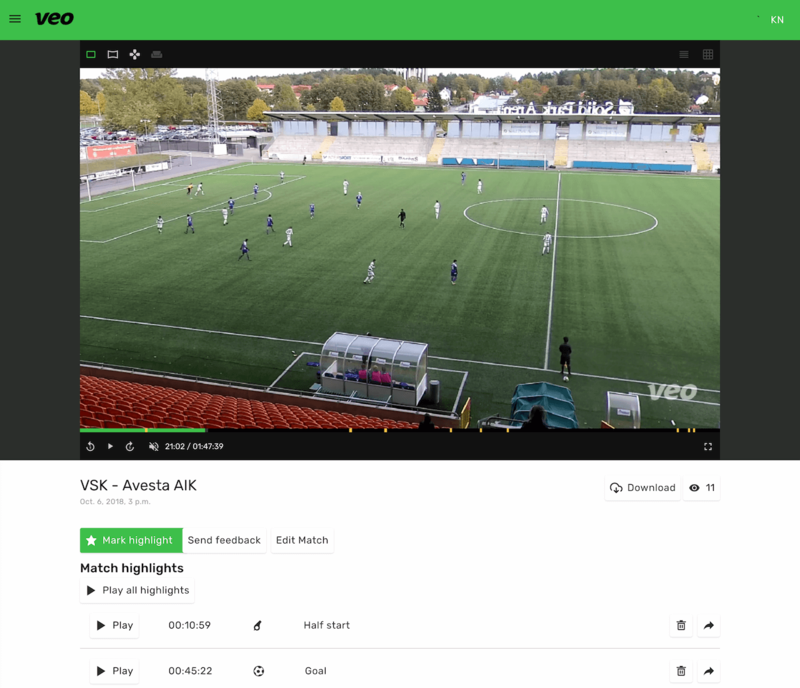 When analysing your match now, you can take control yourself and watch the game in any direction. To help your analysis we give you different play modes to choose. Veo gives you a high resolution 2048 x 2048 pixel image. You can digitally zoom in to watch specific plays in details. You can also choose to zoom out to get a better overview. Pan the full 180-degree recording to watch in the direction of your choice. Use your mouse to take over control and be your own cameraman. With grids and lines, you can get visual guidelines to the positioning of your players. We use advanced technology to place the graphics on top of the pitch only without overlaying the players. With Veo, you will get simple and easy tools for adding your analysis to the recording. 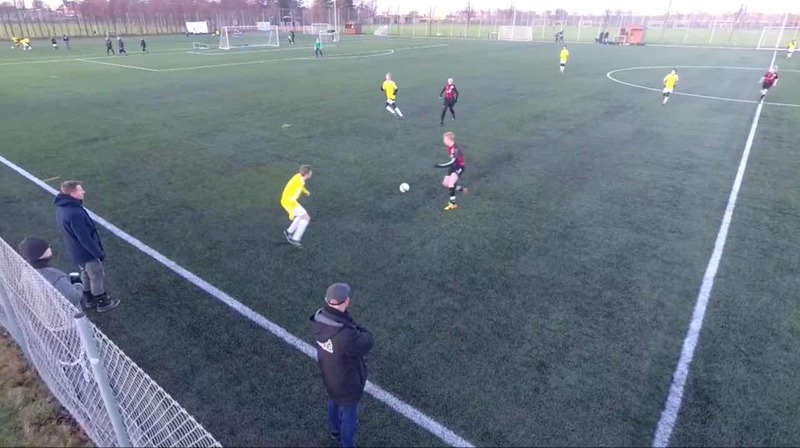 Your take on the match will help your players to learn and improve their skills to get better football players. Tag any of your invited players involved to help them improve themselves. Write an additional comment for your players to understand your point better. Mark your favourite highlights using our easy to use highlight creator. You have full control over in- and out points to create the exact moment of interest. With team management, you can create all your teams and invite players and coaches to join the team for further sharing of highlights and reviews. Two high-resolution lenses, internal storage and a large battery, sets you up for recording multiple matches. It's super flexible. You can take it anywhere, and use on any football pitch. Most users can set up and start a recording within 2 minutes. Your mobile device controls the Veo camera. It serves as a remote, with all the recordings stored directly on your camera. Connect to the camera using its built-in wifi. Connect the camera to the internet, and it automatically uploads all the recordings to your account. Our intelligent software will work on your videos and return a fully automated video within 24 hours. During 2019 we will be able to leverage our recognition software to bring revolutionary new features to our customers. Dynamic heatmap showing most covered areas of the pitch. The positioning of the players can be displayed as 2D maps for a better overview of player positions. We will serve a range of automated statistics to speed up the analysis. Because we know the exact position of players and the ball we will be able to present statistics usually only for high-end systems. Ever wanted to know how much distance your team has run throughout the match, and compare it to the opponent. Draw directly on the screen with advanced drawing tools to better highlight situations to improve players. Use the interactive mode to capture highlight with your custom directions taking over zoom and pan. Even more automated highlights for you to faster skip to exciting plays in the recording. Want to watch all shots on goal? Share highlights with one or more players. Keep conversations about highlights between player and coach private. Let players reflect on their highlights. During 2019 we will expand our analysis tools so you can do even more. Tell us about you and your organisation, and see how Veo can help automate your recordings.